In our little sport, it’s almost become a tradition to describe our day to everyone. Not sure how it started. Back in the ’90’s I would write a detailed report of my races so I could reference nutrition or whatever at a later date. Nowadays they tell the story of the day. For those so inclined, here’s the breakdown of my day at the 2013 Ironman Texas. My race morning was uneventful. Woke up at 4:30, had a light breakfast and hopped in the car for the 1.3 mile drive from my house to the transition area. After setting up my transition, I walked about a mile to the swim start with my wife and used stretch cords to warm up the arms for the swim with my friends and teammates. With 15 minutes before the start, I got in and swam around a while to continue the warm up. With about 8 minutes to go till the start, I positioned myself front and center. When the pushing and shoving started with about 5 minutes til the cannon, I decided to just ask people what they were looking to swim (time-wise) so I would know what kind of fight I might be in for. The guy to my right was hoping for a 52 min swim, so I figured I would see him for a while. Almost immediately after I asked the question though, I was completely caught off guard. About 5 feet behind me a women chimed in and said, “Are you TJ Fry?”. A little startled I said “yes”. Then she said, “I love your blog. ‘Window to the Soul’ was a big help. Thanks”. I couldn’t help but smile. Not exactly the moment I was expecting to talk about my blog. So to Ashley in Georgia, thank you for the kinds words!! Made my morning…… Then I asked the guy on my left, and he had a goal time of 1:25. Now I don’t mean any offense to any 1:25 swimmers out there, but I immediately thought “Really, You’re throwing elbows in the front line and hoping to be middle of the pack?”. And they wonder why people get run over in the swim. So I told the guy, (and I know this might have come off brash) “Look, if you get right behind me for the start, give me 6 strokes and you will have clear water to swim in.” He wasn’t having any of it though, so the elbows and jockeying continued from all sides. With about 2 minutes to go I caught a lucky break. A kayak was coming through the swimmers to the immediate left of us and I quickly ducked under the kayak so that now it was on my immediate right. Then I may or may not have “nudged” the kayak over to my right, condensing the area I was just treading water in and opening up a hole on the front line right next to me. Then I kept it there. The kayak then got the warning from Mike Reilly and started moving out of harms way, but the swimmers to the one side of me didn’t have enough time to regroup and completely fill the hole back in, which left me with some nice space. Then BANG. I hit the gas, and in about 6-10 strokes I was clear of all traffic and swimming up front. A teammate of mine and former LSU swimmer, Sean Leneave got an even bigger jump on everyone and had gapped me before I had a chance to get on his feet. So I stayed at my own pace and quickly found myself all alone, with Sean a few dozen yards ahead, and a small group a few dozen yards behind. Both gaps grew as the swim wore on. Before I got to the canal, I began passing some of the pros. Once in the canal, I could no longer see Sean or his lead boat, and likewise couldn’t see anyone behind me. The canal, or waterway section of the race is great because the navigation is minimal and the crowds are lining the course, which is unique in the swim. So you can see family and friends cheer you on as you finish that last half mile. In the last 100 yards or so I eased off the pace almost like a warm down, and get my head on straight for the transition. Would I have done anything differently? Train more. a common theme for this race. This race coincides with the busiest time of year at work, and workouts get missed. otherwise I’m pretty happy with the 52 minute time. I raced up the stairs, grabbed my bag and had my helmet on before I even entered the tent. Dumped my bag, put on the shoes and belt, grabbed the food and glasses and took off. I stopped briefly at the sunblock station and they got me good. I grabbed the SHIV and left. 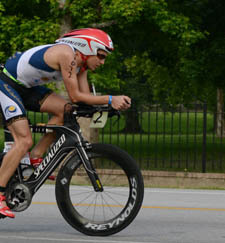 T he first few miles of the bike always feel more like a sprint race than they do an Ironman. Heart Rate is high, excitement is up, tons of energy, and you’re still soaking wet. I immediately ease up on the effort to try and get everything under control as quickly as possible, but the legs felt good. In the first 2 miles, one of the pro men that I passed in the swim came up and passed me. He wasn’t riding that much faster, so after he got about 50 yards ahead, I paced off of him as we headed out of The Woodlands. Average speed was about 25mph, but it felt very comfortable. Around mile 8 I caught up to Sean (swim winner) and he fell in behind me at a good bit more than the legal distance. The 3 of us picked off a few pro women, and then the pro I was following, #26, started riding away with another pro male who caught and passed us. That left me leading the amateur race overall with empty road ahead of me. Pace was brisk (time split at 30 miles was an average speed of 24mph) but felt good (and heart rate was right where it needed to be). At the 40 mile mark, first Sean, and then another athlete came by putting me in 3rd. At this point I knew it was only a matter of time before the super bikers started showing up. And they did, but this year they came by at a much slower rate, which told me that I was riding well. Came through the halfway point right at 2:30 and felt comfortable and ready to take on the headwinds as I headed back to the finish. This section of the course had the rough roads and the headwinds, so while the elevation is a slight net drop, the ride home was much tougher. Add to that the sun, which was really starting to beat down. The temperature on my Garmin showed 98+ degrees here, which I’m sure was including the radiant heat off the road. It became really noticeable with my aero helmet as it only has 1 real air vent. My head felt like it was cooking at times. Other than that, I fared pretty well here and remained comfortable. Then right as we got to the end of the chip seal road and hit the smooth asphalt I heard the dreaded hissing noise of a flat tire. I knew immediately that the hopes for Kona were gone. Given the limited training I’m able to get in, I need everything to go right to grab a slot, so a flat tire was all but a nail in the coffin. I could feel the motivation die. Regardless, I grabbed the aerosol fix-a-flat and crammed it on the valve, but because it was a clincher, the tube wouldn’t stay put and I would just bury the valve in the deep rim. Even with my thumb holding the valve in place, I couldn’t get enough pressure on it to engage the aerosol can. A Total bust. For me the lesson learned was two fold. #1. The rolling resistance folks may feel that a lower pressure tire offers a lower resistance and a better ride, but the softer tire pressure also allows greater opportunity for a flat. #2. Clinchers with deep rims don’t work with fix-a-flat. A tubular would have been fine here as the valve is glued to the rim. Of course none of this “learning” is helping me get off the side of the road. I have a tube and CO2, but it’s going to take a while to pry out, so right as I resign myself to a much longer time on the side of the road than hoped, an athlete rides by and tells me the support crew was back a ways headed my way. Perfect! Sure enough, about a minute later up rolls the motorcycle with a rack of spare wheels on the back. He switches my wheel and then had to go back to his tools to adjust the Garmin receiver, as it was stuck in the new wheel. A short adjustment later and I’m back on the road. 10 minutes total time lost. Almost immediately I found myself in a really bad spot. I usually feel a little rough for the first few miles after stopping at a gas station on training rides, so I’m thinking this was related, but either way I felt like hell. Just couldn’t get it together. So I started switching things up. Some solid food, different drinks at the aid station, etc. Then I finally, FINALLY started feeling better and watched the pace pick back up to pre-flat speeds. The final 10 miles through The Woodlands felt smooth even though it had gotten really hot, and I got ready for the run. Would I have done anything differently? Ride a high pressure tire and not read the internet forums. I left the shoes clipped to the bike like I always do, hopped off the bike and ran for my bags. Because of the way the transition is set up, there is a long run down a sidewalk, then a u turn back to enter the section where you grab you’re Transition bag. Because of the heat, the sidewalk had gotten extremely hot. So hot that my feet actually started burning. At first I thought I was being a sissy. It would just be like when I was a kid at the pool, as soon as I jump in the pain would go away. I was wrong. I felt the pain in my right foot from the first step in the run to the last step, and still feel it as I write. That, of course was some nice foreshadowing for the run. It was going to be hot. Extremely hot. Burn the skin off your feet hot. I got myself together and got going…. Heading out for the marathon I knew this was going to be rough. The temperature was soaring and there was no help from the clouds. I started slow, and let my body adjust to running before I made any decisions. One of my big concerns on the run is my breathing, as I’ve had trouble from time to time with my breathing in some of these races. At mile 1 the airways were clear and the running legs were starting to show up. This heat was intense. I got into a comfortable rhythm and was surprisingly comfortable. Pace wasn’t fast and my burned foot was killing me, but the effort seemed liked it could be easily repeated for at least 26 miles. I made the left onto Panther Creek (western most section of the run) and felt like I was in an oven. The sun was cooking me from above and the radiant heat from the road was suffocating me from below. This wasn’t going to be a performance based marathon. It was going to be a survival based one. I was in my 8th Ironman and soon to be 7th finish, and every one of them have been done in 90+ degree heat. So I’ve learned when it’s time to drop any time goals and move to mindset to survival. This switch was going to happen very early into the run. The crowds on the waterway were big and I was able to see lots of familiar faces which helped me keep the pace up. At the beginning of the 2nd loop, just like the first, I came through the first aid station where my wife Amy was, and it was a big lift. She seemed to be having a good time and her spirits raised mine. The second loop was very similar to the first, but after 15 miles, the pace started noticeably slowing. The heat was just getting to be too much. As I started loop 3, the wheels began to come off. I was having some real trouble regulating my body temperature like before and the pain in my right foot from the burn had become overwhelming at times. Any turn on the course would cause me to wince. I was no longer able to run continuously as I would start to get dizzy and light headed, despite having energy in the legs. So my run would come down to negotiations with myself. Not the good kind I had hoped for like “Just hold this pace until you run that guy down”, but rather, “Just run to that light pole and try not to pass out”. And that’s how my last lap would play out. Run to the light pole. Run through the shaded section. Run 10 steps. Each mile got a little worse despite the amount of ice I stuffed in my clothes. As the dizziness got more acute, I walked. As it got better, I ran. This was going to be a race for the thin runner build or the younger athletes, and I was neither. The final run through the waterway helped my moral with the crowds all cheering, but the day was not to be as I had hoped. And that’s the Ironman. You can’t fake it and you can’t force a great day. You take what the day gives you and you adjust to the punches. Like every boxer, we all have a plan for the perfect day, until we get punched in the face. Great read! That heat was brutal. I have been one of your biggest fans since you were 8 years old. You continue to amaze me and I am so proud of you.